Symphony is a secure team collaboration platform for professional and enterprise users, with a current focus on financial services. The CEO believed our product needs to support core email use cases in order for our users to completely switch over to Symphony for their communication needs. Deliver the MVP of an integrated email experience in Symphony and take the learning to inform the design for the next generation of Symphony. I was the only designer on this project, working with a team of three developers, a tech lead, and my CEO as the PM. As a chat-centric platform, integrating email functionalities into Symphony introduces a lot of challenges because of the differences in paradigms between the two modes of communication. To better understand the problem space, I interviewed existing users to learn about their behavior around these two forms of communication. I made sure to include users in a range of job functions and with varying levels of adoption of Symphony as their communication tool. These interviews reveals some common problems people experienced with email communication in a chat-heavy work setting. In additional to these interviews, I also dug into our backlog of user feedback having to do with email support–most of them are feature requests collected by the sales and business development teams. Users have to constantly monitor their email client to ensure they are not missing important messages. As email in Symphony is a brand new concept, I was asked to explore a few options to help the team decide on a direction for our MVP. 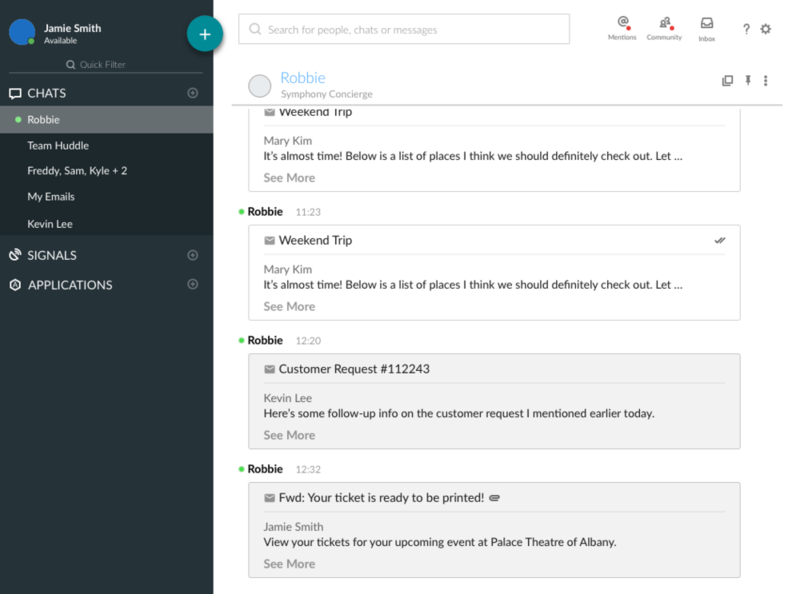 We first needed an idea of what email looks like on Symphony. To help answer that, I started by looking at how email may be related to existing Symphony entities. This exercise helped me to form a point of view on how email fits into the Symphony ecosystem. I mocked up a number of high level concepts to communicate my thinking to the team. For example, I looked at a few options for email’s entry point on Symphony, evaluating the pros and cons of each option. With some upfront research and concept exploration done, the team was ready to get started building our MVP. We looked at my research findings, and based on feasibility and business value, we decided to first tackle the problem of context switching between Symphony and email client. Our hypothesis was that having email integrated into Symphony will make it easier for users to manage their communication as they only need to use a single tool. We also decided on adding email’s entry point to our navigation because although there’s a risk of cluttering our navigation, we felt that we could test our hypothesis relatively easily with this approach. As part of process for figuring out our scope, I led user story mapping exercise to help the team gain alignment on the set of features for MVP. Throughout this phase, I frequently built prototypes to test my assumptions and to discover usability issues. We recruited 10 users for this study that was to span 2 week. Our recruiting criteria was informed by my initial research to identify users who are likely to be receptive to accessing emails on Symphony. We knew that certain types of users absolutely need their email client for specific email features not included in our MVP. We wanted to filter out these users so as not to skew our results. We will take these learnings as we work on the next version of Symphony, which will include email as a first class citizen.